A pocket in a part which has inward curving surfaces, but are not completely enclosed. A solid object that fills such a cavity could not be removed. Many manufacturing processes are incapable of producing parts with such a feature. Steel made from molten iron or ferrous scrap with carbon, manganese, sulfur, silicon, and phosphorous. Carbon steel contains up to about 2% carbon, up to 1.65% manganese, and 0.60% or less silicon. Its mechanical properties are primarily determined by the amount of carbon present. Aside from carbon, only residual quantities of other elements (nickel, chromium, molybdenum, etc.) are present, except those added for deoxidization or to counter the deleterious effects of residual sulfur. Carbon steel is also called plain or straight carbon steel, and ordinary steel. 1) Iron with a carbon content that exceeds the solubility limit of carbon in austenite (approximately 1.8%) at the eutectic temperature. Cast Irons typically contain 1.8-4.5% carbon, plus silicon, sulfur, and phosphorus; they may also have other alloying elements such as chromium, manganese, nickel, and vanadium. 2) A generic term for a large family of cast ferrous alloys like gray cast iron, white cast iron, malleable cast iron and ductile cast iron. Sometimes the word "cast" is left out, resulting in "gray iron," "white iron," "malleable iron," and "ductile iron," respectively. The enclosed space between two mold halves which forms the shape of the desired part. Often times, molds are designed with more than one cavity, allowing multiple identical parts to be molded in one cycle. The most common number of cavities are 1, 2, 4, or 8. The pressure inside the mold cavities caused by the injection of molten material during the mold filling stage. Cavity pressure depends on the material, injection pressure, and the geometry of the cavities and runner system. For most polymers, the cavity pressure is between 4,000 and 10,000 psi. Also known as the Celsius scale, a temperature scale which sets the freezing point of water at 0° and the boiling point at 100°. To convert centigrade to Fahrenheit multiply by 1.8 and add 32, e.g., (100° x 1.8) + 32 = 212°F. A man-made solid produced by the fusion of inorganic substances. 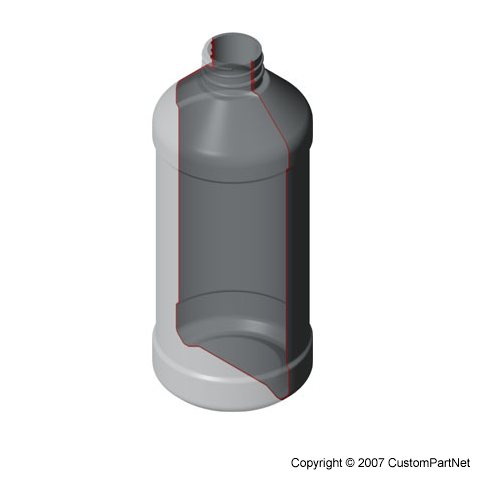 A more specific definition within the slip casting industry is that the term 'ceramics' has come to signify the use of talc-ball clay slurries to cast ware for firing at low temperatures, where as the term 'pottery' is used to refer to ware fabricated by individuals and companies using plastic clays of all types and at all temperature ranges. 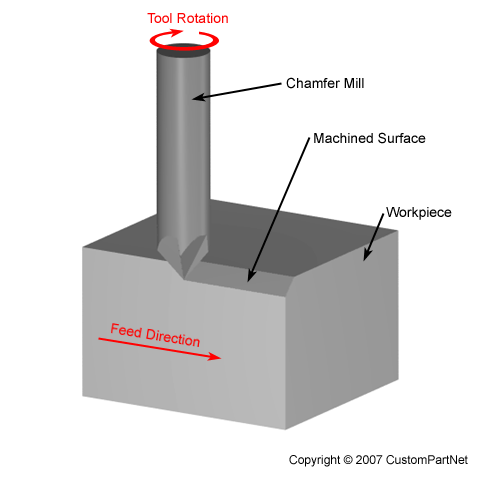 An operation in which a chamfer mill makes a peripheral cut along an edge of the workpiece or a feature to create an angled surface, known as a chamfer. It is assumed that the angle of the chamfer is 45 degrees, so that the chamfer width is equal to its height. The chamfer length can be the complete perimeter of a workpiece or feature, just one side, or even a part of a side. Also, a chamfer can be machined on either the exterior or interior of a part and can follow either a straight or curved path. The force that is applied to a mold by the molding machine in order to keep it securely closed while the material is injected. The clamp force is typically some factor of safety greater than the separating force, which is the outward force exerted on the mold halves by the injected material. The distance that the rear mold half must travel in order to be securely clamped to the front mold half. The clamp stroke must be large enough to allow the part to be ejected from the mold. The measure clearness in a transparent or translucent polymer. Abbreviated CTE for Coefficient of Thermal Expansion. The change in length per unit length, area per unit area, or volume per unit volume for each degree change in temperature. Typical units for linear CTE are cm/cm°C or in/in°F, or expressed as millionths of unit length change per unit length per degree (microns/(meter ºC)). The change in a unit of length of a material per unit change in temperature. Expressed in in/in-°F or cm/cm-°C. The CTE is not constant, but varies with temperature, so it is often expressed as an average over a temperature range. The ASTM test measuring the CTE in polymers is D696. Protrusions or depressions occurring in multiple directions on a part, including those opposing the tooling direction, such as undercuts. The complexity of a part is determined by several parameters, so 5 preset configurations are available. In a custom configuration, the user may specify the feature count and the mold requirements, which may include side-cores, lifters, unscrewing devices, and parting surface complexity. The amount of compressive stress that a material is capable of sustaining before buckling or being crushed. If a material fails in compression by a brittle fracture, the compressive strength has a very definite value. Materials such as clay brick, cast iron, and concrete can exhibit great compressive strengths, but brittle failure results in a catastrophic failure. The crushing strength of concrete, called the cube strength because the test involves crushing a concrete cube, is around 6000 psi, granite is 20,000 psi, and cast iron ranges from 60,000 - 120,000 psi. In the case of ductile, malleable, or semiviscous materials (which buckle rather than shatter), the value obtained for compressive strength is an arbitrary value dependent on the degree of distortion that is indicative as failure of the material. Such arbitrary values are referred to as compressive yield strengths whereas complete compressive failure is termed ultimate compressive strength. The measure of a materials ability to transmit electricity or heat. The reciprocal of conductivity is resistivity. In molding and casting processes, the cooling time is the time required for the molten material to cool and solidify in the mold before the part is ejected. The theoretical cooling time can be calculated from material properties, but a correction factor is often applied to account for how the mold geometry and cooling lines affect heat flow. Chemical symbol Cu. Element No. 29 of the periodic system, atomic weight 63.57. A characteristically reddish metal of bright luster, highly malleable and ductile and having high electrical and heat conductivity; melting point 1981 (degrees) F.; boiling point 4327 F.; specific gravity 8.94. Used in the pure state or alloyed by other elements to make brasses and bronzes consumed in building construction, electric and electronic products, industrial machinery, transportation equipment, and numerous consumer and general products. Used in the pure state as sheet, tube, rod and wire and also as alloyed by other elements and an alloy with other metals. An additional mold piece that is used to form features that cannot be formed by the two mold halves, such as an undercut. A core can be placed in the mold cavity or actuated through the side (side-core). A box used to form expendable cores, such as those made from sand. The percentage of expendable cores, such as those made from sand, that are defective from the core-making or core-setting processes. 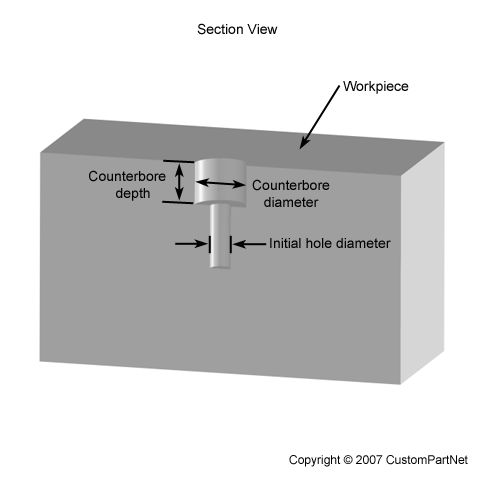 An operation in which a counterbore tool enters the workpiece axially and enlarges the top portion of an existing hole to the diameter of the tool. Counterboring is often performed after drilling to provide space for the head of a fastener, such as a bolt, to sit below the surface of a part. The counterboring tool has a pilot on the end to guide it straight into the existing hole. 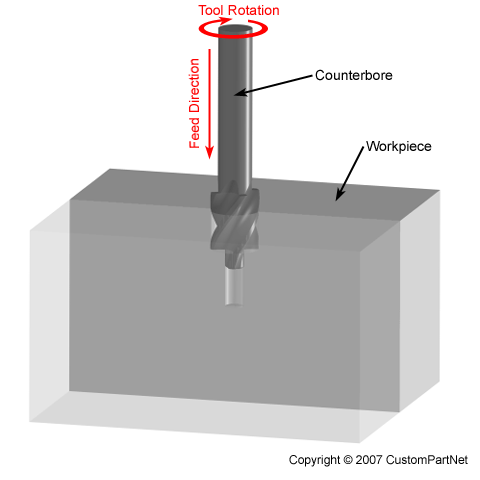 An operation in which a countersink tool enters the workpiece axially and enlarges the top portion of an existing hole to a cone-shaped opening. 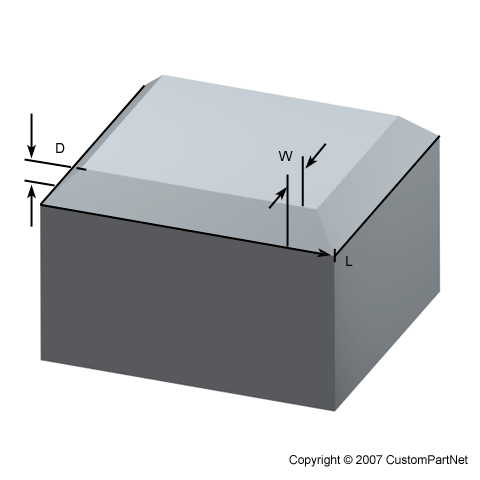 Countersinking is often performed after drilling to provide space for the head of a fastener, such as a screw, to sit flush with the workpiece surface. 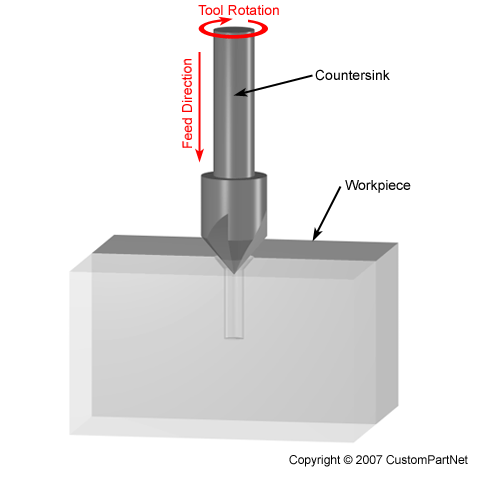 Common included angles for a countersink include 60, 82, 90, 100, 118, and 120 degrees. The cost of cutting a workpiece from a piece of stock. 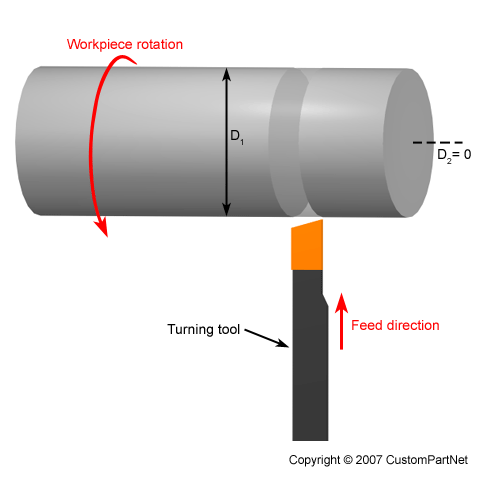 The diameter of the workpiece at the location of a cut in a turning operation. The cutting speed and spindle speed can both be calculated for this diameter. Depending on the form of speed control, only one of these values will remain constant as the cut proceeds and the diameter changes. The length that the cutting tool travels at a specified feed rate in order to perform an operation. The cut length can be calculated based on the operation type, feature dimensions, and cutting parameters. The cut length includes the distance to engage and exit the workpiece, but does not include any distances that are traversed at a rapid travel rate. 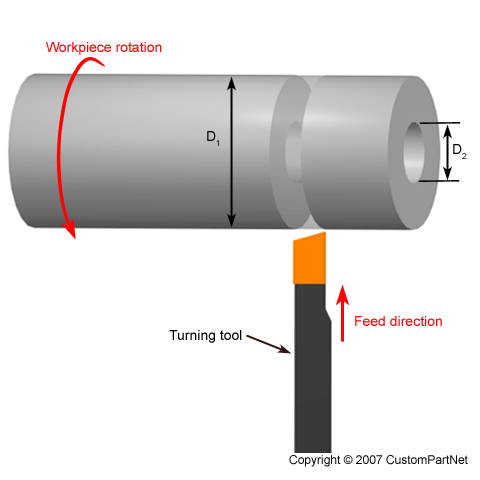 A turning operation, also known as parting, in which a single-point cut-off tool moves radially, into the side of the workpiece, and continues until the center or inner diameter of the workpiece is reached, thus parting or cutting off a section of the workpiece. A part catcher is often used to catch the removed part. 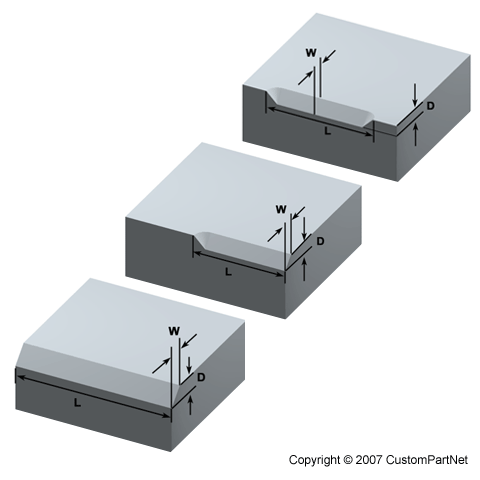 The width of the cut when cutting a workpiece from a piece of bar stock. 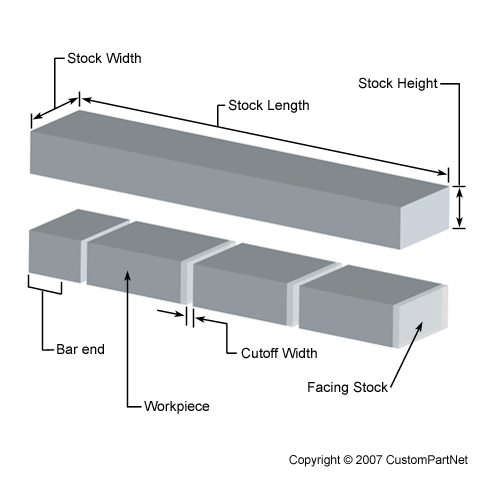 The cutoff width is used in determining how many workpieces a single piece of bar stock will yield. The amount of power, typically measured in horsepower (hp) or kilowatts (kW), which is required by a machine to perform a cutting operation. This power can be calculated from the material removal rate and the specific cutting energy of the material. The cut power for all operations must be less than the maximum power available from the machine. The cutterpath describes the path of the tool while it travels the cut length in order to complete an operation. For some operations, the required cutterpath will involve not only cutting away all the material (roughing) but also cutting along the perimeter to leave a smooth finish (profiling). While a “Rough & Profile” operation will complete the desired feature, it is sometimes preferable to use a “Rough only” operation followed by a “Profile only” operation that uses different cutting parameters. The time required for the tool to travel the cut length at a specified feed rate. The distance that the cutting tool or workpiece advances during one revolution of the spindle, measured in inches per revolution (IPR). In some operations the tool feeds into the workpiece and in others the workpiece feeds into the tool. For a multi-point tool, the cutting feed is also equal to the cutting feed per tooth, measured in inches per tooth (IPT), multiplied by the number of teeth on the cutting tool. The distance that the workpiece feeds into each tooth on a multi-point cutting tool as it rotates. This distance, also called the chip load per tooth, describes the size of the material chip that each tooth will cut. The feed per tooth, measured in inches per tooth (IPT), multiplied by the number of teeth on the cutting tool is equal to the cutting feed, measured in inches per revolution (IPR). The speed of the workpiece surface relative to the edge of the cutting tool during a cut, measured in surface feet per minute (SFM). The time that is required for one complete cycle of a manufacturing process. Typically, the cycle time is the time required to produce a single part. However, many processes allow for the production of multiple parts per cycle. For example, a mold may contain multiple cavities or machining can be performed on multiple parts at once.